On these cold winter days we are warmed by summer memories and the inspirational efforts of a Cincinnati Hills Christian Academy student. 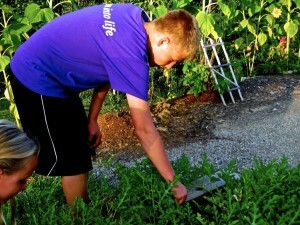 Alex O’Brien partnered with CHCA to begin building a garden in September 2013 on land next to the middle school; His purpose – to grow fresh produce for our hungry neighbors. First inspired during a campus tour of Yale, Alex brought the idea back to Cincinnati. When Alex decided to participate in our annual Hunger Walk & 5K Run, the wheels started to set into motion. During a conversation at the event with our President and CEO Kurt Reiber, Alex learned of the L.I.F.E. Food Pantry, a partner of the Freestore located in Loveland – Alex’s own backyard. Alex made plans to donate the veggies grown in the garden to L.I.F.E. “I want to show it’s not just a few people donating some cans of food,” Alex told the Community Press. With the support of the school and fellow students, Alex planted a variety of crop in 2014 – ranging from beans, corn, peppers, kale, potatoes and broccoli. 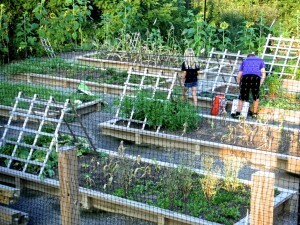 The first season yielded enough veggies to contribute to nearly 370 meals. And the impact continues to grow. Produce from the garden helped to contribute to more than 750 meals in 2015. Plans are in the works for an addition of grapevines in early spring 2016. “I appreciate all of the help and support of the school, and hope that the addition of the vineyard will become a strong staple for donations in the future,” said Alex.